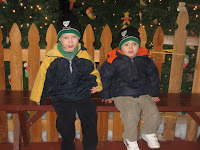 Today, we took a train ride to go see Santa. 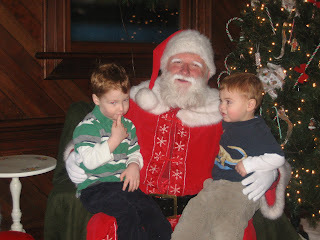 The boys got to meet Santa and tell him what they want for Christmas. 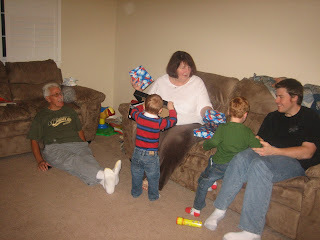 We were expecting Santa to reward them with a candy cane but instead he gave them a wooden model train!! We also had hot chocolate and cookies. We watched them making the cookies right on the train! We also explored several train cars!! Then after we explored, it was time to take the train back! 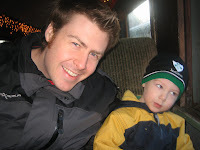 The boys really loved riding on the train! The train car we rode on was built in 1913! It originally ran from Pittsburgh to Chicago. What a fun day!! Our only complaint was that it was a very chilly day, but I guess that isn't Santa's fault!! Isn't the Christmas season fun?? This Thanksgiving was a lot of fun because Grandma and Grandpa Knight visited us. Brandon and I cooked our first Thanksgiving meal! I think it turned out pretty well. 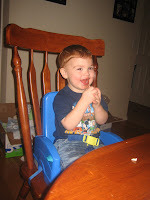 After dinner, we gave the boys some See's Candy. Seamus loved it. It was great to spend some quality time with grandma and grandpa. And they were a big help around the house! Brandon and I even got to go out a few times by ourselves. 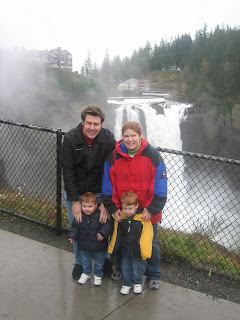 We also took them to one of our favorite spots, Snoqualmie Falls. It is such an awesome wonder to see! All in all, it was a great trip. We are so happy they came to see us!! 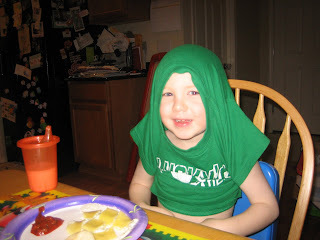 Lately Owen has been pulling his shirt over his head and pretending he is a banana. It is a very cute ordeal. Even if I worry that all his shirts are getting stretched out. I Finally Have a Craft Room!